The Parkview Cancer Center in Fort Wayne, Indiana was looking to create an area of respite from the stressful atmosphere of the cancer hospital environment, by bringing a touch of nature indoors. 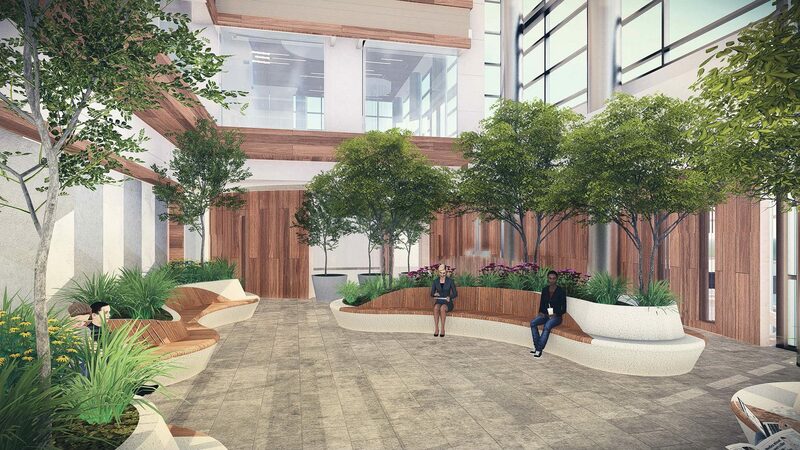 It wanted an indoor garden that would accommodate staff, patients and visitors, show consideration for patients’ special conditions and environmental sensitivities, while being easy to maintain. The design also needed to provide for a diversity of uses from dining for the adjacent café to a space for contemplation and prayer, and be flexible enough to accommodate individual private moments, small groups and an event space for 50 people. To create this “get-away” space, the healing garden is designed as a stylized walk in the woods, with forms and plant material that evoke a sense of familiarity, warmth and comfort. 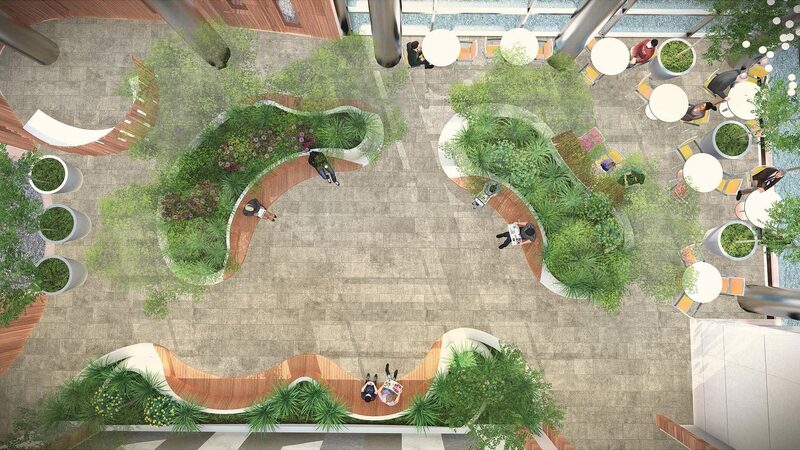 Since the garden is located on the second floor, all planting is within raised planters. A nature-inspired sinuous flowing form that rises and falls in fluid movement is followed throughout the garden: from the custom precast concrete planters to the wood benches nestled within, from the pavement pattern to the planting drifts. These forms are especially attractive when viewed from the patient/family porches at the infusion therapy level that overlook the garden from above. Three different kinds of tropical evergreen trees are chosen for their “temperate-zone” forms and in keeping with the interior light levels. The understory is planted with tropical evergreen ferns, which closely resemble the ferns found in the region. The planting palette also includes annuals for seasonal color. CRJA-IBI Group worked with lighting experts to determine supplemental lighting required for plant growth while being comfortable for normal day-time use. The garden will also be sensitively lit to provide a signature night-time presence for the institute. 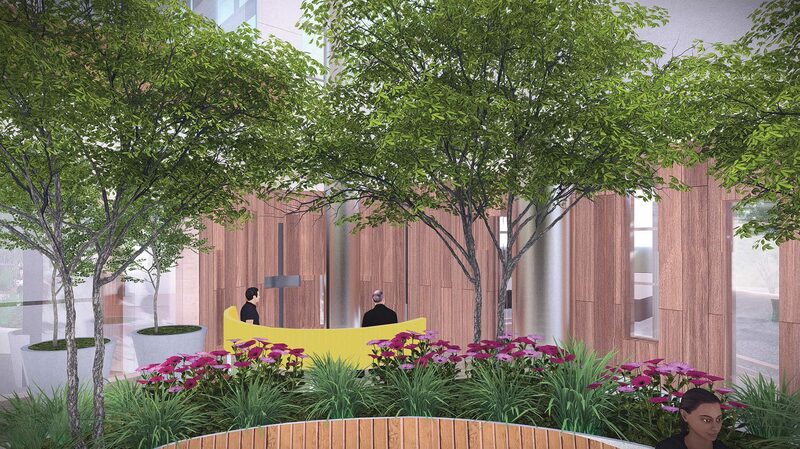 The healing garden is set to open summer of 2018, as a visible public icon of Parkview’s caring/healing environment.